If you spend any time in Tel Aviv you will most likely come across the street Nachalat Binyamin. 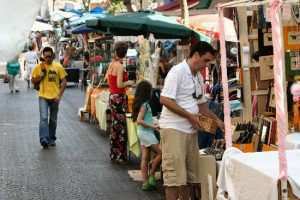 While it is just a single street you will find loads to do there as the street is home to some of Tel Aviv’s greatest restaurants, bars and shops. For instance, every Tuesday and Friday local artists set up an Arts and Crafts Market where they sell their handmade products. The market began in 1988 and has been attracting people ever since. The products on offer range from stained glass mezuzahs to copper leaf necklaces and wooden boxes made from tree trunks. Just browsing for an hour or so is a great way to spend an afternoon. If you get hungry then you should pop in to the restaurant Mamot. The name means ‘mothers’ and the restaurant offers a variety of home cooked dishes such as brisket, lamb meatballs and chicken schnitzel. It’s a great place to experience some authentic Israeli food and a friendly atmosphere. If you’re a fan of ice cream then be sure to visit Arte. Stefania Pagani and Marco Camorali moved to Israel after studying ice cream making in Tuscany and Sicily. Their shop offers ice cream with no artificial flavours or colouring. There are also homemade cookies and cakes and each week the shop changes the flavours so you’ll have the perfect excuse to treat yourself. If you’re looking for a fun evening out then take a look at Beit Haamudim, just off Nachalat Binyamin on Rambam Street. The name means ‘House of Columns’ and it is obvious why once you see the European style building. During the day it is a friendly café and then in the evening it turns into a lively jazz bar with live music playing nearly every night. Those looking for a place to gather with friends can try The Prince, a busy rooftop bar. Once you’ve made it up the spiral staircase, decorated with funky murals, you’ll be greeted by a warm and inviting atmosphere complete with great music, a view of the city and enjoyable drinks. When you want to have a meal out you could try Biciletta. The restaurant is housed in a 100 year old building just off Nachalat Binyamin. It has two floors and a lovely garden at the back. Thanks to the relaxing, down to earth environment, it is a great place to enjoy an evening with friends. Fans of wine should go and checkout Brut, on the corner of Montefiore and Nachalat Binyamin. It is a wine and food bar run by five friends whose lives revolve around good food and wine. The food changes on a regular basis and there is always a large selection of wine from around the world. If you’re after a bit of jewellery then stop by Shani Jacobi who runs a unique jewellery shop showcasing urban and natural inspired designs. Each piece on offer is completely unique and there is always something fun to see. These are just some of the delights of Nachalat Binyamin and you are sure to find more as you get to know the area.